With pioneer spirit, the 28 year old Mr. Sherman arrived in Sioux Falls in June of 1873. He invested in real estate, milling, banking, an electric plant, and a railway company. E.A. 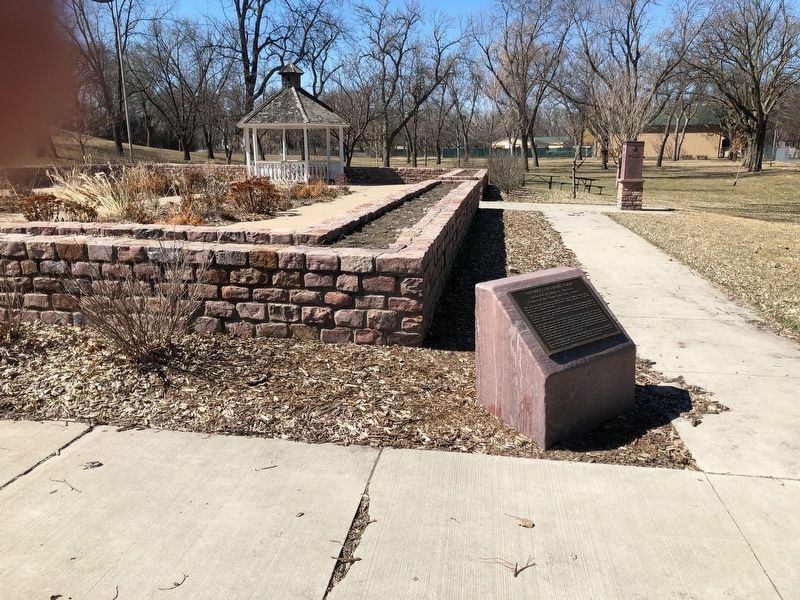 Sherman was involved in the community as County Superintendent of Schools, Treasurer and Auditor of Dakota Territory, Village Board of Trustees, Alderman, City Commissioner, and Chairman of both the Park and Library Board. In 1910 Mr. Sherman donated 52 acres for the first portion of Sherman Park. Always a lover of nature, he envisioned a park system for Sioux Falls that would provide several well developed parks. He was instrumental, as a member of the legislature, in passing enabling legislation authorizing cites to acquire and operate a system of parks under the supervision of a Park Board. Parks and the Sioux Falls Park System became his principal interest during the latter years of his life. Erected 2010 by Mary Chilton DAR Foundation, Sioux Falls Area Foundation, Soroptomist Club, and the Sioux Falls Parks & Recreation Department. Location. 43° 32.196′ N, 96° 45.74′ W. Marker is in Sioux Falls, South Dakota, in Minnehaha County. Marker is on W Indian Mound Pl. Touch for map. Marker located in the Sherman Centennial Plaza. Marker is at or near this postal address: 805 S Kiwanis Avenue, Sioux Falls SD 57104, United States of America. Touch for directions. Other nearby markers. At least 8 other markers are within 2 miles of this marker, measured as the crow flies. E. A. Sherman (a few steps from this marker); Sherman Park (a few steps from this marker); Columbus College (approx. 0.4 miles away); Department of Veterans Affairs (approx. 0.4 miles away); Battleship X (approx. half a mile away); Children's Care Hospital & School (approx. 0.6 miles away); Drs. Van Demark (approx. one mile away); AAUW Sioux Falls Branch (approx. 1.2 miles away). Touch for a list and map of all markers in Sioux Falls. More. 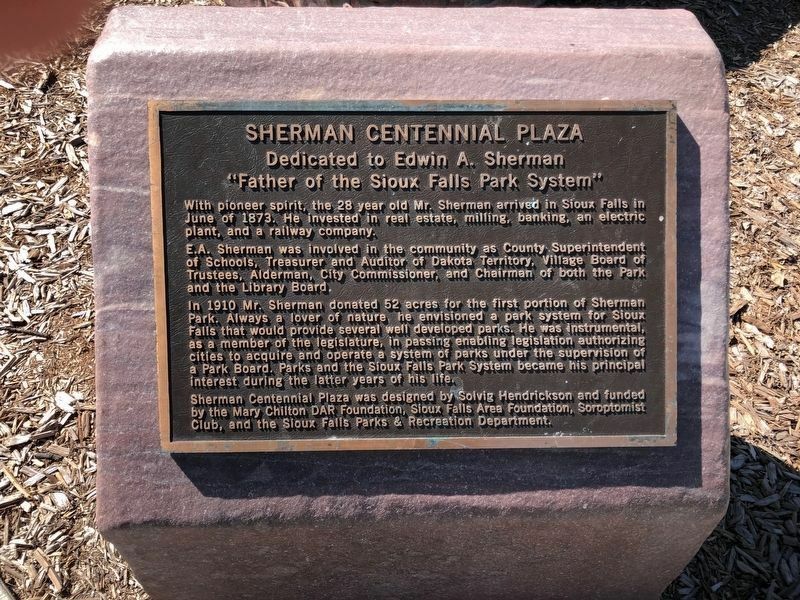 Search the internet for Sherman Centennial Plaza. Credits. This page was last revised on April 14, 2019. This page originally submitted on April 10, 2019, by Ruth VanSteenwyk of Aberdeen, South Dakota. This page has been viewed 27 times since then. Photos: 1, 2. submitted on April 10, 2019, by Ruth VanSteenwyk of Aberdeen, South Dakota. • Andrew Ruppenstein was the editor who published this page.